Wrinkles Schminkles Silicone Pads use a 100% Medical Grade Adhesive to hold them in place on your skin while you sleep. This means when you peel them off and store them, a build up of dead skin cells, dust and hair particles can occur. 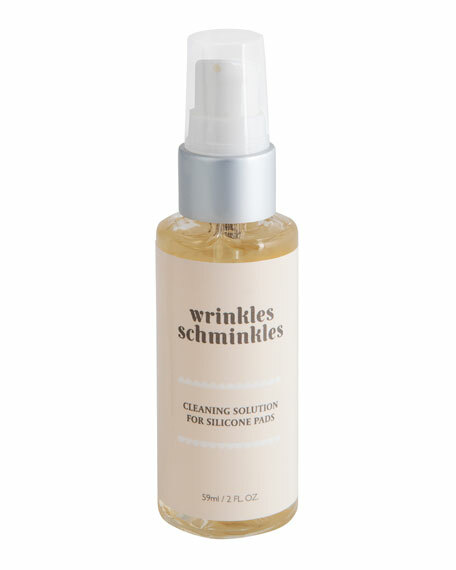 Wrinkles Schminkles Cleaning Solution has been specially formulated with ingredients designed to clean our reusable Silicone Pads without breaking down the adhesive prolonging their life to give you as many uses as possible. It is really important that standard soaps, creams and oils are not used to clean the pads as they will break down adhesive. Use Wrinkles Schminkles Cleaning Solution on your Chest Smoothing Kit, Neck Smoothing Kit, Mouth Smoothing Kit, Hand Smoothing Kit or Forehead and Eye Smoothing Kit  with confidence. Clean your Silicone Pads with Wrinkles Schminkles Cleaning Solution approximately once a week (or whenever required) and store your Silicone Pads on the storage sheet included in your pack. Step 1. Washing: Use 1-2 pumps of the Cleaning Solution and massage into the adhesive side of the Silicone Pad with finger tips. Thoroughly rinse with lukewarm water. Step 2. Drying: Place the Silicone Pads face side up until completely dry. Step 3. Storing: Once the Silicone Pad is completely dry, you will notice the adhesive has more stick to it. Place it face down on the plastic storage sheet included in your packaging until your next use. This innovative 3-step product range offers innovative skincare treatments to help fight the signs of aging on your chest, décolletage, décolleté, neck, and face—overnight. SAFE & EFFECTIVE. PAINLESS & PRECISE. LIGHT & COMPACT. Compact, professional, at-home hair removal technology for the face and body.